Are your kids as crazy about the movie Coco as mine are? The kids love the humorous skeletons, the singing, and the colorful imagery in the movie. I love the family emphasis in the movie and so it makes it a great one to watch and rewatch. If you haven’t seen this movie it is a must see for family movie night. I wanted to do a really fun themed project this week with my middle little daughter. She is in preschool on Monday, Wednesday and Friday so Tuesday and Thursday are our time to bond and what better way than to do a project! You knew I was going to say that right? Sometimes the baby even sleeps long enough in the morning for us to actually get the project completed, but usually I spread out my DIY kids projects over the course of the week. 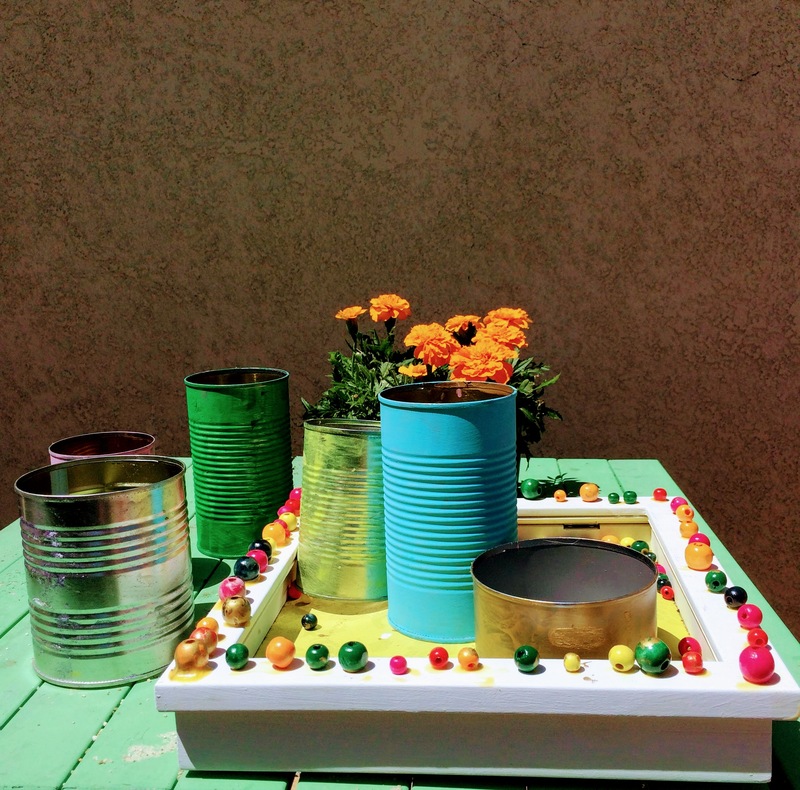 We used tin cans, acrylic paint, brushes, colorful wooden beads, wood glue, potting soil, a few rocks, a shadow box and a six pack of marigold flowers. We chose to focus on bright colors to create our planter and marigolds because the movie coco is so insanely colorful and marigolds take center stage on the day of the dead. I’ve been really into gardening lately so I decided to make this project as a planter for the kids. 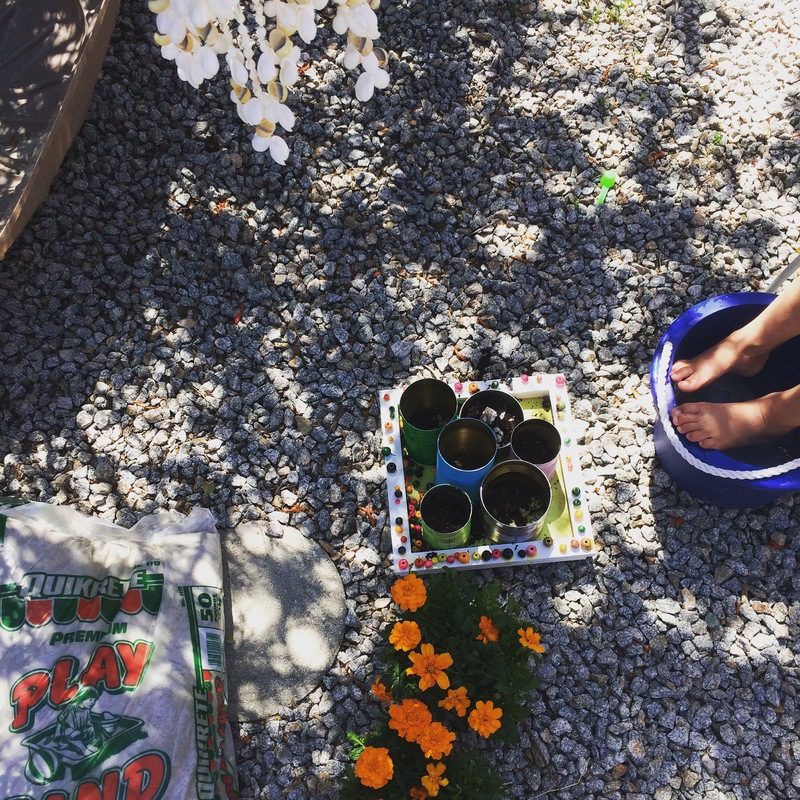 I like colorful things in the garden because it prompts imaginative play and also makes the space feel more like a kids space. The first thing we did is pick coco themed colors, I told my four year old to go bright because the colors in the movie are pretty bright and vibrant. 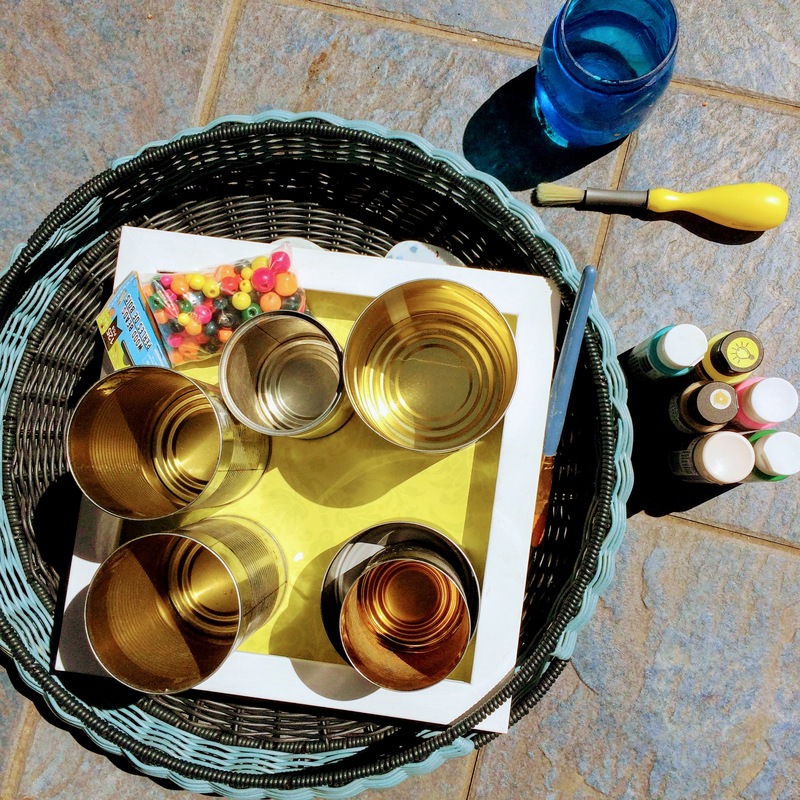 Next, we painted the cans, one each color (you could easily add patterns to customize the project) and set them in the sun to dry. While the cans were drying we used wood glue to attach the colorful wooden beads to the frame of the shadow box. I chose the shadow box so that I could carry around this marigold planter but there are different items you could use as the base of the planter. After the wooden beads were all glued to my daughters liking, we went back to the tin cans she had painted and I added a second coat of acrylic paint. You could prep the cans ahead of time with spray paint which would give a more finished look, for our purposes though, acrylic worked just fine. When the cans were dry, I went in and actually cut open the “bottom” of each can so it became a hollow tunnel. The reason I decided to do this is for drainage. I’ve learned that with better drainage flowers last a lot longer. When they are blocked on the bottom the water sits and it tends to kill the plant. It isn’t completely necessary to cut the bottom of the cans but this is my approach. The final and really fun part was to plant the flowers! We added a single layer of rock, a few scoops of potting soil and then a marigold plant in each can. For now, I am leaving the backing on my shadow box planter so I can easily carry it around, when the water starts to overly soak the cardboard backing, I will remove it and find a permanent home for our coco planter! The marigolds and any plant recently planted, need a lot of water to settle into their new home. So after we got each one into a can, we watered a bit and then a bit more a few hours later I will try to keep watering them every few days. This is a great task for kids, to gain responsibility and to understand living plants. 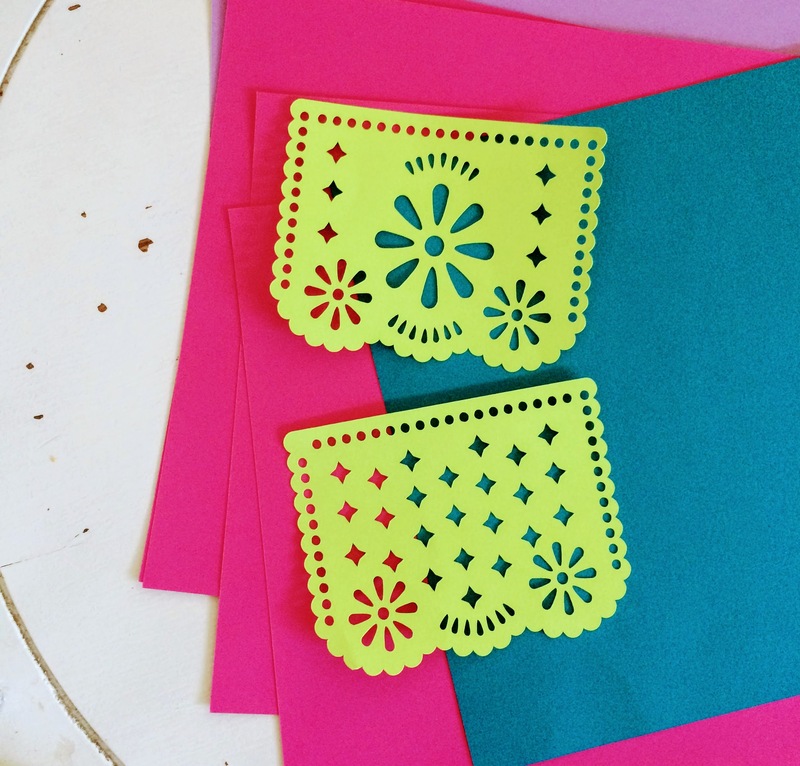 I love the picado papel in the movie and so to finish off the project, I cut out a few with my cricut machine using some bright cardstock. 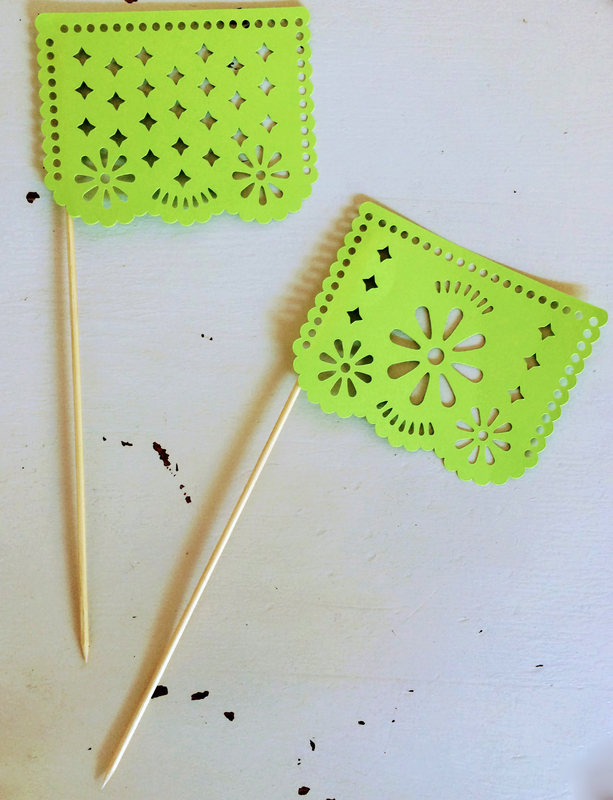 I glued these on skewers to make little flags. They would be fun for a party too. I love how in the movie they are used to illustrate a story, what a rich culture. We had a lot of days of sunshine last week and spent a lot of our time in our garden. 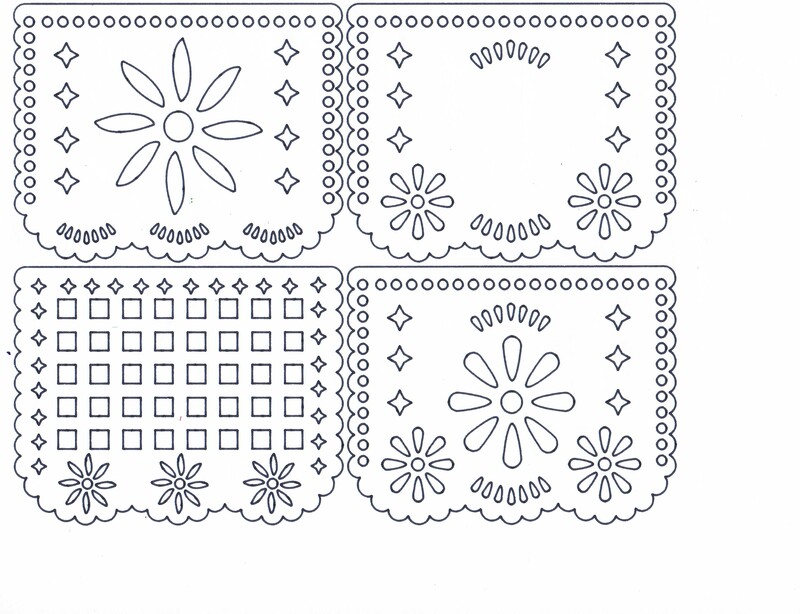 For some down time, I created these sweet little coco themed, picado papel coloring pages with the use of my cricut explore air 2. 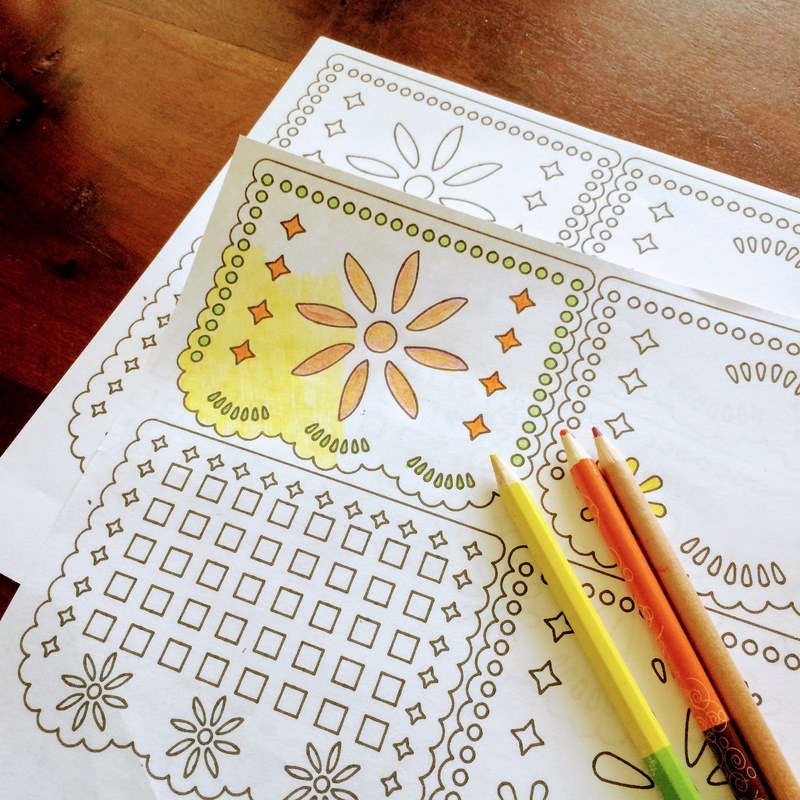 I love all the designs and will attach the printable for free in this post (See link below). My kids had some fun today coloring them with colored pencils and cutting them out. Enjoy your week!